Master suite: king sized bed and large walk-in closet, private marble tiled bathroom with heated floors and rain shower, patio doors open onto private balcony with hot tub and outstanding Mountain views over Reykjavík. Third bedroom is a cozy space with a trundle bed that pulls out to be king size when fully extended. Wardrobe for storage. Marble tiled showers with rain shower heads. heated floors and towel racks. 17th century hand-carved furniture, Chesterfield chairs and sofa, 55" smartTV with internet connection, telescope for stargazing, high-speed WiFi throughout, amazing views over Reykjavik. Washer and dryer, iron and drying space. You don´t have to go far to enjoy Icelandic nature. The house is surrounded by stacked stone walls, the walkways are made from local lava produced by the Hekla volcano eruption in February of 1693. After 15 minutes drive from Downtown Reykjavik, Iceland, luxury apartments you reach this relaxing villa with amazing views of the city skyline including Hallgrimskirkja (Iceland's biggest church), Mountain views. Esja, and Snæfellsjökull (glacier). After a day spent exploring our beautiful country, you can enjoy nature's wonderful Northern lights and shining stars from the comfort of the hot tub on a private patio with your loved ones or from the master suite overlooking Reykjavík. Private parking is also included for your convenience. The villa provides 150 sq meters of luxury with 2 private parking spaces, a large private garden, master suite, and patio with a spacious hot tub. The bathrooms also provide heated marble floors and towel racks. I hope you enjoy the gourmet kitchen with space to cook as much as you would like. You can share an amazing view over dinner in the dining room with comfortable seating for up to 8 people. The neighborhood provides a quite relaxing atmosphere to enjoy your stay. The house is also close to "Smáralind" and "Kringlan" Shopping Malls (less than 5 minute drive) and a 10 minute drive to Nauthólsvík beach. There are many options nearby for wonderful food and even grocery shopping. Iceland store (5 min drive) is open 24 hours for those midnight cravings. I would recommend renting a car as driving is the best way to see the area. I can help you with rental options if you would like. Private parking spaces are provided in front of the home for your convenience. However, public transportation is great in Iceland. The closest bus stop is a 2 minute walk. Taxis are also available for hire throughout the city. I hope you enjoy your stay here in Iceland. The villa provides 150 sq meters of luxury with 2 private parking spaces, a large private garden and patio with a spacious hot tub absolutely outstanding . The bathrooms also provides heated marble floors and heated towel racks. I hope you enjoy the gourmet kitchen with space to cook as much as you would like. You can share an amazing view over dinner in the dining room with comfortable seating for up to 8 people. All of this is only 15 minutes from Downtown Reykjavik ICELAND. The villa is an easy 15 minute drive from downtown Reykjavik, ICELAND. The neighborhood provides a quite relaxing atmosphere to enjoy your stay. The house is also close to "Smáralind" and "Kringlan" Shopping Malls (less than 5 minute drive) and a 10 minute drive to Nauthólsvík beach. There are many options nearby for wonderful food and even grocery shopping. Iceland store (5 min drive) is open 24 hours for those midnight cravings. Driving is the best way to see the area. Private parking spaces are provided in front of the home for your convenience. I can help you with rental options if you would like. However, public transportation is great in Iceland. The closest bus stop is a 2 minute walk. Taxis are also available for hire throughout the city. The house is easy to find at a great location in Kópavogur, 15 minutes (driving distance) away from downtown Reykjavik, Iceland. The house is in great condition for a relaxing and comfortable stay. The location works beautifully for a quick drive into the city and provides a good starting point for scenic drives along the coastline, the golden circle, blue lagoon, the sand planes of the east and the famous Jökulsárlón glacier at the south coast. 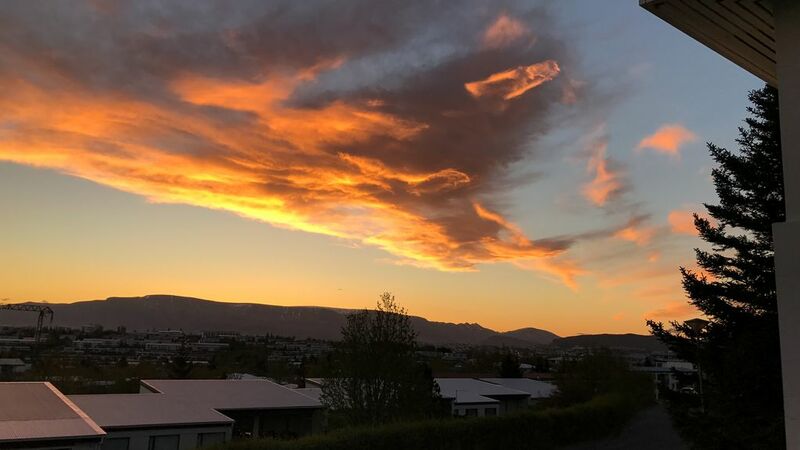 Enjoy the amazing Mountain view and Reykjavik from the living room window or from the hot tub on the patio, and see the northern lights dance in the sky during the evening and night. This is a private home. I am not there all the time, but I will respond to all the questions you have by email or phone. Guests will be charged any extra cleaning or damages made above expected normal use. All guests must be booked before arrival. People in Iceland take their shoes off when entering a home. Please follow this custom. A shoe rack has been provided for you at the entry. Please clean the kitchen after use. This includes no dirty dishes or food left on the tables or in the sink when you check out. Do NOT take the towels to the Blue Lagoon. You have to bring your own or rent it there!!!! There is a strict no smoking policy inside the home. Please take in to consideration that I live among neighbors. Do not play loud music that might disturb them. 1. BATHROOM The bathrooms also provides heated marble floors and heated towel racks.IN THE master suite bedroom 2.BATHROOM Washer and dryer in one bathroom for your comfort. Heated towel racks in both bathrooms. Villa with amazing views of the city skyline including Hallgrimskirkja (Iceland's biggest church), Mt. Esja, and Snæfellsjökull (glacier) Northern lights and shining stars from the comfort of Hot Tub. In Iceland, we only open the windows where it is usually windy. Heating is located in all floors of the house. luxury apartments. Linens Provided are provided on all beds and extra copies in the closet. luxury apartments. Washing Machine is located on the toilet along with the dryer. luxury apartments. 2 private off-street parking spaces just in front of the house. All towels are included. luxury apartments. 17th century hand-carved furniture, Chesterfield chairs and sofa, 55" smartTV with internet connection, telescope for stargazing, amazing views over Reykjavik. Quiet hidden panel high efficiency dishwasher luxury apartments. With freezer and ice maker. luxury apartments. 6 burner Falcon gourmet gas stove. luxury apartments. Nespresso single cup coffeemaker with complimentary coffee for your use. luxury apartments. Toaster is located in the kitchen next to the microwave. luxury apartments. Dishes & Utensils are all supplied in the kitchen. luxury apartments. Gourmet kitchen with space to cook as much as you would like. You can share an amazing view over dinner in the dining room with comfortable seating for up to 8 people. 55” smart HD TV with more than 40 channels and connected to WiFi. luxury apartments. Photo books of Iceland Nature and History are located in the living room. luxury apartments. A balcony equipped with a Hot Tub and incredible views over Reykjavik and Mount Esja. luxury apartments. The house is easy to find at a great location in Kópavogur, 15 minutes (driving distance) away from downtown Reykjavik, Iceland. The house is in great condition for a relaxing and comfortable stay. The location works beautifully for a quick drive into the city and provides a good starting point for scenic drives along the coastline, the golden circle, blue lagoon, the sand planes of the east and the famous Jökulsárlón glacier at the south coast. Enjoy the amazing view of Reykjavik from the living room window or from the hot tub on the patio, and see the northern lights dance in the sky during the evening and night. You don´t have to go far to enjoy Icelandic nature. The house is surrounded by stacked stone walls, the walkways are made from local lava produced by the Hekla volcano eruption in February of 1693 Please do not hesitate to contact me, I’ll be able to assist with anything you require. I booked this place 6 of us (4 adults, 2 kids) and it was perfect as our "near Reyjkavik" home base. The unit itself was wonderfully appointment. It had a great sitting area for the kids to do kids things, and enough space for everyone. Sigurdur met us on arrival and gave us a quick tour. Very nice and a wonderful host. A++ all around! Thank you for not only staying with us, but also taking your time to write this kind review. I am very glad to hear that you enjoyed the time with us SJF Villa Iceland. We hope to serve you again in the near future. The property was lovely, and has been furnished tastefully and to a very high standard. A perfect place to stay with your family! Very clean, beautiful and perfect location! Would recommend! Owner great to deal with and very accommodating! Excellent base for exploring the area. The apartment is clean, well equipped and stocked with essentials. A lovely warm and homely base to come back to after a day of exploring. The view from the terrace was incredible. We didn’t get lucky with the Northern Lights but we were there for New Year and the fireworks were unbelievable. Whenever you visit, I’m sure the view won’t disappoint. We didn’t meet the host, but we had no need to. Everything was just as described and he answered our questions quickly. We looked forward to the warm floors ,hot tub and great views every night after our daily adventures. This house has everything including a hair drier for the girls !! After 15 minutes drive from Downtown Reykjavik, ICELAND, you reach this relaxing villa with amazing views of the city skyline including Hallgrimskirkja (Iceland's biggest church), Mt. Esja, and Snæfellsjökull (glacier). After a day spent exploring our beautiful country, you can enjoy nature's wonderful. Northern lights and shining stars from the comfort of the hot tub on a private patio with your loved ones. Private parking is also included for your convenience. I would recommend renting a car. The house is easy to find at a great location in Kópavogur, 15 minutes (driving distance) away from downtown Reykjavik, Iceland. The house is in great condition for a relaxing and comfortable stay. The location works beautifully for a quick drive into the city and provides a good starting point for scenic drives along the coastline, the golden circle, blue lagoon, the sand planes of the east and the famous Jökulsárlón glacier at the south coast. Enjoy the amazing view of Reykjavik from the living room window or from the hot tub on the patio, and see the northern lights dance in the sky during the evening and night.